PHILADELPHIA – It was as though they heard an alarm clock and realized they were late for the airport. 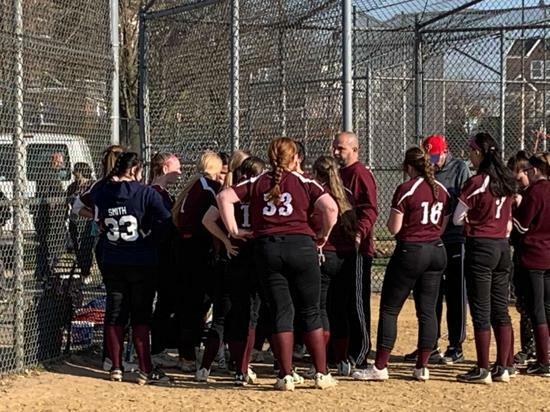 Trailing 1-0 through five innings on a gorgeous April 4 afternoon, St. Hubert’s scored eight runs in the sixth inning and rode the complete game pitching of senior Lindsay Davies to an 8-1 victory over disappointed Little Flower. In the sixth, nine of the 12 batters reached base for the host Bambies via five hits, three walks (one intentional), and a costly error. Hubert’s big inning started with a walk to Davies, followed by a Frye double and an intentional walk that loaded the bases. Senior Erin Hogan patiently waited out a walk to tie the game, and three straight singles increased the lead to 4-1. Four batters later, Frye came up again and delivered a two-run triple to cap the scoring. The player who appreciated the offensive explosion was Davies, who admitted that the warmer the weather, the better she pitches. The win helped ease the frustration of a 6-5 loss to Archbishop Carroll two days earlier, a game Hubert’s led until late. Hubert coach Dave Schafer addressed his troops at practice on Wednesday and spoke frankly. The final message was that the Bambies needed to put the game behind them immediately. “You have to give Carroll all of the credit in that game because they only got one ball out of the infield,” said Schaefer. “We made four mistakes, and their base running was the key. Asked about the improvement of teams such as Little Flower, Schafer recognized the Catholic League’s changing landscape, but also lauded Hubert’s winning reputation. Although it’s difficult any time you come up six outs shy of beating a team like Hubert’s on the road, Little Flower has the look of a playoff squad. At 2-2, the Sentinels have defeated Archbishop Wood (10-9 in nine innings) and Conwell-Egan (11-7), and lost 6-5 to an undefeated Lansdale Catholic team. According to Little Flower junior hurler Ginny Britto, the Sentinels are prepared for the long haul. “This year our team is full of talent with a lot of potential,” said Britto. “We have really had to come together to get the job done, especially in our game versus Archbishop Wood. 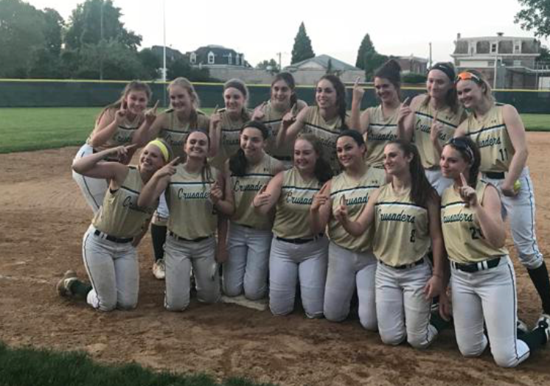 At 4-0, Lansdale Catholic has won close games against Carroll and Little Flower while adding two victories via blowouts. On April 9, the Crusaders will visit defending champion Archbishop Ryan in a battle of two undefeated squads. According to Lansdale Catholic senior Rebecca Tiley, the Crusaders are learning from some of last year’s lessons. “After starting kind of slow with two big losses early in the season, we knew we had to come out strong this year,” said Tiley. “Those early losses turned out to cost us a run in districts and states.